Also known as Galapatha Raja Maha Viharaya, this temple is said to be one of the ancient Buddhist temples of the city. Story goes that the temple was built in 12th century. However, with Dutch invasion in 16th century, the temple faced serious damage. Later on, the temple was rebuilt. Today, when you visit the temple you get to see its renovated version. The temple is famous not only because it is ancient but it also because of the tooth relic of the 3rd disciple of Buddha who was buried in the Stupa. Watch out the cared pillars on the right near the entrance doorway which is said to have ‘Nari Latha’ motifs carved on it. The highlighted feature of the temple is the 25 feet long statue of sleeping Buddha. The large bell with inscriptions at the entrance is another must-see feature of the temple. Do not carry liquor or meat into the temple. Bentota Railway Station and from there, three wheeler or tuk tuk. Eateries are available at Bentota townsquare. How popular is Galapatha Buddhist Temple? 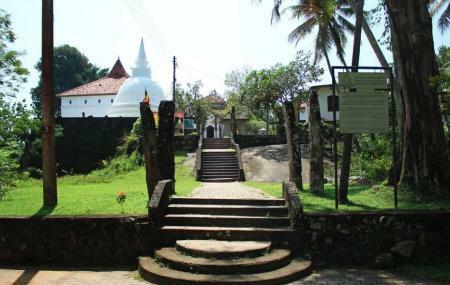 People normally club together Bentota Beach and Sunshine Centre while planning their visit to Galapatha Buddhist Temple.